There is no doubting that the Puma V1.10 SL is built around speed! Weighing in at 5.3oz, it is currently the lightest soccer cleat to be released on the market and unbelievably light when you pick them up. But there are several other keys areas that need to be addressed if you are contemplating purchasing a pair, like comfort and performance for example. Another key issue is sizing, and I was lucky enough to be able to try on two different sizes in order to find the right pair. I went with a size 10US for testing in the White/Blue colorway. Since their release, one of the key questions about the V1.10 SL has been centered around their sizing, with many people unsure of what size to get. The team at soccer.com strongly recommend ordering a full size up. I normally wear a size 9US, so decided it only made sense to get a size 9.5 and 10. Both fit pretty well, but it was quiet evident that the 10 was a better option. They fit pretty tight and a little narrow at the toe area. My advice: Make sure to order a full size up. Just like with the Adidas adiZero, I was extremely shocked at how easy these boots were to break in. Being lightweight, I expected there to be an adjustment period but after one training session they were game ready. The microfiber upper is extremely flexible and feels broken in from the very start. I didn’t encounter any blister or cramping issues, so my experience breaking them in was positive. This is where I felt the V1.10 SL excelled. Since these are designed for speed players, touch and control are going to be the more important attributes needed. And Puma have not disappointed. The upper, although thin, gives great feel on the ball. It also has a slight grip feel that I noticed helped with touch. I have to admit, these are probably one of my favorite boots for dribbling in. When it comes to shooting, the V1.10 SL is not going to help in regards to shot power. But, if you are controlling the ball the way you want to, then opportunities are going to be created through your play. So, I feel they have benefit in terms of helping you get into better positions for better shots. Protection. For some players, specifically defenders, protection is a big issue. My opinion is that the V1.10 SL offers the least protection of any boot on the market, particularly around the tongue region. This is something that is pretty much expected from a lightweight boot. If you are a defender, or someone who tackles a lot I would advise looking elsewhere. The second issue with the white/blue design is that they scuff really easily. The microfiber upper can look very damaged after playing. You will need to clean your boots after playing to keep them in top shape. So, for example, here is a before and after picture that shows they can be cleaned really well after playing. I am a huge fan of the V1.10 SL and would definitely recommend them to players who are looking for a speed boot. They rank amongst my favorite releases to date and compliment what I look for in a boot to a tee. I am still a little baffled at how companies are producing these super lightweight boots, but they are managing to do a good job at releasing quality boots. These break in really easily and are probably one of the best boots on the market for real touch and control. They are more suited to wingers and fast forwards than any other position. Watch out for more releases in the range over the coming weeks like the V1.10 SL Lightning! My math says its 92 out of 100 not 82 as it says on the review! wow. 92 is a very good score. so do you recommend adizeros or these if some one is looking for a lightweight boot? Thanks bryan. by the way, how is that puma ball? and just out of curiosity, what is the best soccer ball you have played with so far in your opinion? christian, i personally dont think superfly II are worth 400$. Bryan did a review of them. They a need a somehow serious breaking period, and that should not be the case for a 400$ boot. I think ill buy this SLs, they look quite amazing and are soo light. bryan, thanks for the reviews, they are very helpfull! bryan, does the little stud in the heel works? i find it quite useless but you tell me. More to come on the ball in the coming week, with a review(all tested) of the top balls currently on the market! bryan, which cleat should I get. Im a huge CR9 Fanboy, and I really want the Superfly IIs, not just for cr9 but because of the fact that its light and has the adaptive studs and flywire. but then again the adiZeros are way lighter. Im confused as to which cleat I should get. Price doesnt matter for me, and im an attacking midfielder. Bryan , how would you compare the sls to the vapors and adizeross which do you think is better? Is there any word from Puma or Soccer.com about these being released in any other sizes? The heel area fits differently to the V1.08, mainly in terms of the amount of material used. I found them to be comfortable but could see where some players might need a boot with more protection. Review/comparison of all 3 is in the works. Not sure about that one, but I would assume they will release smaller/larger sizes. What size are you looking for? I'm normally an 11.5 So I would probably be looking for a 12 or 12.5 if they run a size small. I guess I'll just have t wait and see I larger sizes become available. Bryan, I know the sizing is different between the adizero and the V1.10 SL but which is lighter have you weighed each one you tested? Thanks for the great review Bryan. The before and after picture was great. You can clearly see how soft and flexible the upper is and how it molded to your feet. Bryan, did you actually weigh these boots? From what I've found out, these aren't actually any lighter than the adizeros, that puma just weighed a size 7 US of these boots (even though they don't come out in this size). 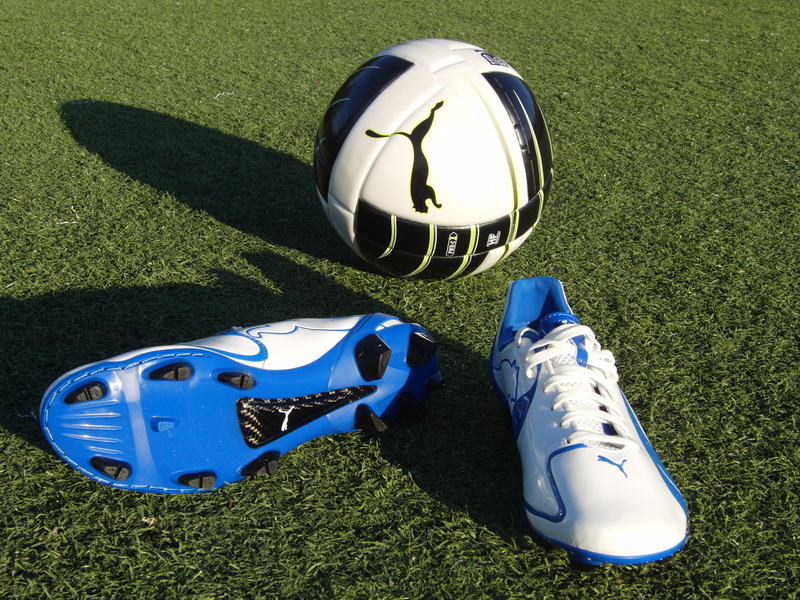 i have experienced sliding when playing on artificial turf with my puma v1.10s, have you experienced anything like this with these? I weigh each boot before reviewing and can confirm they are 5.3oz. I have a little, mainly because the blades are angled differently. I notice it most when I have a low trajectory or get to change direction. But it has not been enough of an issue to stop me from wearing them…yet anyway! bryan, what do you use to clean the cleats,thanks. I have simply been using a warm wet rag, and wiping them down well. Hi Bryan, I’ve heard rumblings that the Puma studs are very easy to wear down. Is this true? If you could let me know how your studs are holding up, that’d be awesome. I haven’t encountered any problems with the studs wearing down. My pair are decently worn right now, the material tends to hold stains. But in terms of studs they are looking good! The upper tends to scuff pretty easily, the actual boot itself is still in great condition but the durability of the upper is not as good as other boots on the market. Love the review, very convincing, but I'm just wondering if these will fit slightly wider feet? Like UA Dominate wide. Cheers. They fit a lot more narrow than the UA Dominate – they have a medium fit compared to the Dominates, which are wide. I am a size 9 and needed a size 10, so if you are a 9.5 you should go a full size up to 10.5. I know you posted up a comparison with the other two lightweights but i cant find it so ig ill ask here. which cleat do you prefer the sl or the adizero synthetic id like to know which has better traction for both soft and firm grounds (fields are typically pretty firm but get very soft even very muddy sometimes because the soccer season corresponds perfectly with our rainy season.) i was looking at the hybrids for the adizero but was worried they would feel sluggish on firm ground and is the weight difference noticeable between the hybrid and normal? Hey I was just wondering if you would get these boots or the superfly 2's if they were the same price? 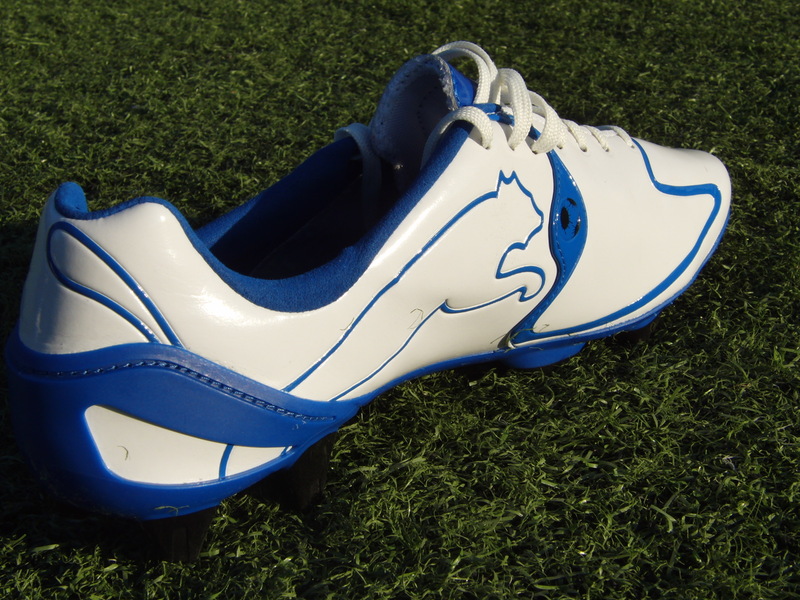 If you are playing on grass surface, I would recommend the hybrids – the weight difference is not noticeable. In terms of the V1.10 SL versus Superflys, i would personally go for the V1.10 SL, they are lighter and easier to break in. i was looking up track spikes and i noticed something. these weigh LESS then alot of kinds of track spikes!! Do the studs wear out fast on these? Should this be something to worry about before I buy them? and I would like your opinion on these vs the vapor 6. thanks! I wouldn’t be too concerned with stud wear as long as you are not using them on concrete! Thanks Bryan! Everyone who has actually tried these out has had nothing bad to say about them it seems! Id still like to know your imput on these compared to the vapor 6 because I cant actually try these on anywhere around where i live! thanks! Bryan, I don't know if you have covered this but I can only find the v1.10 sl in size 9 – 10.5. Do they offer any other sizes? Yeah that has been a common question – I have emailed my contact at Puma to try find out! I will let you know what I can find out. I'm getting these cleats how do they hold up? Especially the studs did you ever lose traction? Bryan, thinking about getting a pair of these boots. I was wondering how the upper material does with wet conditions and water, any experience? Thanks. The upper works out fine in wet conditions. My concern is on slippy surfaces, with traction being an issue if the ground is anyway muddy! Hey! I was just wondering when I compared the Puma v1.10 and the v1.10 sl, if I in the regular v1.10 wear a UK 7,5, should I go for UK 8 or 8,5 in the lightweight? I wonder because you said that the v1.10 also was pretty tight and that you probably should have gone for a half size up in them. So should I go a half size up from the regular v1.10? V1.10 fit a half size small, while the V1.10 SL fit a full size small. Hey Bryan, I tried size 9, natural size. It was freaking tight. My toes were absolutely no room to "breath". They were curled down perhaps. Then I tried on 9.5, the toes still curled down, but not as much as the size 9. So, question is this, how are toes supposed to be? Fitting? Are they supposed to be "relaxed" or curled down? Please advise. 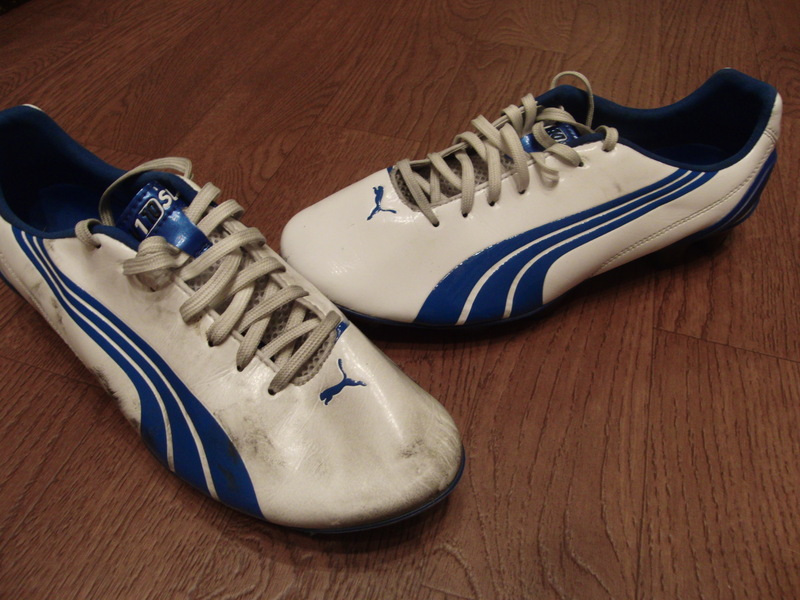 I just wonder how similar these cleats are compared to the Puma v1.06? And also if they will last for a full season? Definitely not curled up! You want them to feel snug, but you also don't want them to cause discomfort. Compared to a normal fit, you will need to order a full size up with the V1.10 SL – they are that tight! Hey Bryan, I was wondering if u could post pictures of your pair in their current condition.. Thinking of getting a pair in either the purple or blue so i'm looking at general durability. I will take some pics and probably have them posted by Monday! Hey I want to buy these and I just had a pair of the puma power cats. i was a size 9.5 in those and im wondering what size i should get for these??? Connor – you are going to want to order a full size up – so I would recommend a 10.5US! The Puma V1.10 SL fits very small. How much of an issue is durability with these? And how would you suggest cleaning them? i just got my puma v1.10 sl from pro-direct soccer in size 9.5 us and there didn't match with the weight in description which was 150g, mine were 190g. also there is a whole lot of thread from the stitching left in the cleat just under the sock liner. Interesting, it does sound like there could be something up with them. Best bet would be to try compare them against a friends pair or in a store. If I wear a size 10 US in the Puma v1.10 k i fg's, what size should i get these in? Thanks! You will need an extra half size to a full size – the Puma SL series fits a lot smaller than you would expect! I went with a half size up. i am looking to buy a light boot, but i can't decide between these and adizeros, i like the fit and look of adizeros, but many of my friens who have had them have had them rip. which would you recommend ? Too small, they fit really tight – you will need a full extra size. I bought vapor 7s and they were a bit too narrow for my foot so i had to return them. Will these be the same deal? or are they accommodating to wide footed players? Thanks ! They are actually a pretty narrow fitting shoe, especially around the ankle. 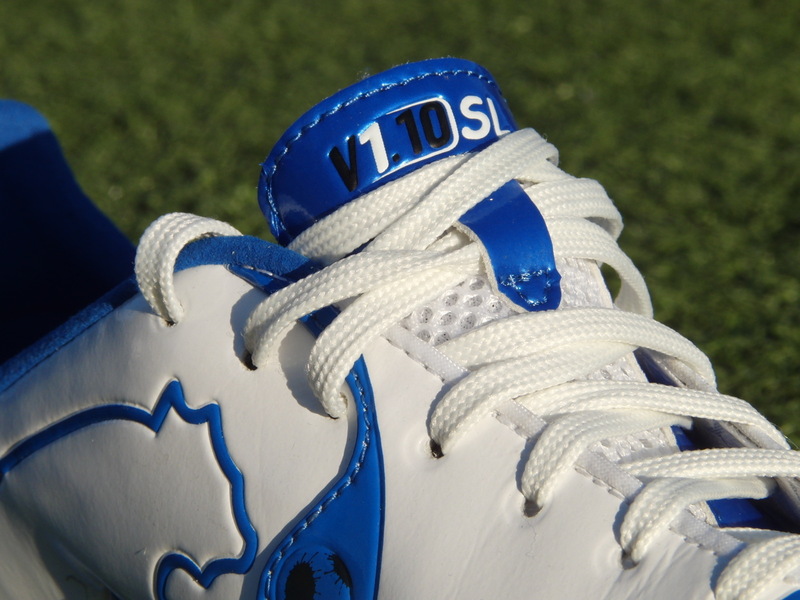 You would have better look with the new V1.11 release as they offer a wider fit toward the front of the boot. I normally wear US 8 1/2, would us 9 fit me in these shoes? It depends what you wear 8.5 in, but yes you will need to go up a half size, or maybe a full size.